We have previously kicked off the new year by announcing our top trends for data and analytics. But when BrightTALK gave us the chance to participate in their webinar summit BI and Big Data Analytics in 2018, we felt it was the perfect platform to share where we feel analytics is headed. Specifically, we’ve reached the age of augmented analytics. In our webinar, Using Augmented Analytics to Gain a Competitive Business Advantage, our Pete Reilly reviewed how Gartner defines augmented analytics: an approach that automates insights using machine learning and natural-language generation. Chief Scientist Mike Finley explained how AnswerRocket answers thousands of questions per day for our users, but most of those questions are actually trying to answer bigger questions: Why are sales down, why are returns increasing, why is one customer segment outperforming another? To further help enterprises answer these complex questions, Mike shared a sneak preview of AnswerRocket’s Extensions. “We might try hundreds of variations of your question, using all of the knowledge we have of the domain model, of the things that other users have historically examined, of the database in question,” Mike said. 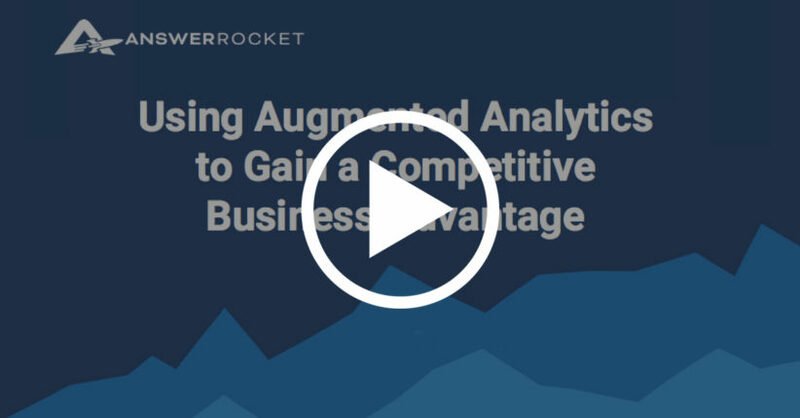 Watch the replay of our webinar to explore how augmented analytics can help your business.